Get higher quality creatine at a better value and take the guesswork out of creatine—trust Creactor. Creatine is one of the most researched supps and most talked about today — over 20 years after it was first introduced to the market. It has been used by almost every bodybuilder and athlete — providing them with an increased overall performance and strength. When you’re looking to make more gains in the gym, consider taking creatine. This power-enhancing supp is still misunderstood and undervalued by many — treating it just like any ordinary supplement. But make no mistake. Not just any old brand or type of creatine will do. There are numerous variations of creatine on the market, and innovation is still taking place. For starters, creatine works by increasing the availability of a molecule called phosphocreatine (PCr). PCr allows the body to produce its own energy called, adenosine triphosphate (ATP) — taking place right inside the muscle. When you take creatine, it enters the circulatory system where it gets distributed to the muscle cells. Once it reaches the muscle cells, it begins the absorption process via a number of specialized creatine transporters. 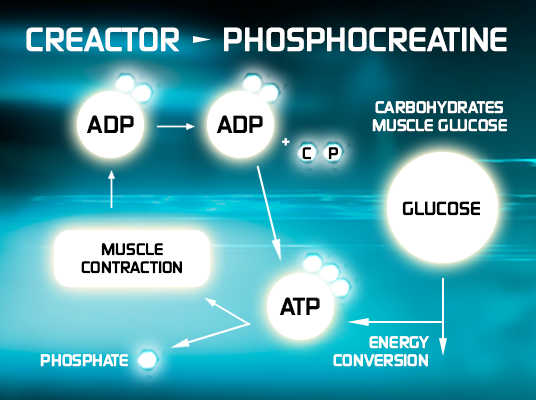 After creatine is absorbed, it then combines with ATP to PCr within the muscle cells. Normally, PCr in the muscle cells gets rapidly depleted during training, but supplementing with creatine increases the body’s ability to store a pool of phosphocreatine in the muscles. This enhances resynthesis of phosphocreatine and ATP production during recovery. The end result: you will be able to lift heavier for a longer period of time — ultimately increasing muscle size and strength. Within the last 10 years, numerous forms of creatine have been introduced — creatine monohydrate was the original form. This form of creatine has been the most studied, yet it’s still not perfect. Changes and some innovations have been made on the supp, producing creatine ethyl ester, which flopped. As of recently there have been a few innovations that have been reviewed by many athletes, citing improvements over the original. These innovations include two new creatine forms: creatine hydrocholoride and free-acid creatine. Creatine HCL: Creatine hydrochloride (HCL) is creatine combined with hydrochloric acid — a cutting-edge creatine that has unique soluble properties. Free-Acid Creatine: Free of acids and salts, free-acid creatine is the purest form of creatine —100 percent pure creatine. In comparison, creatine monohydrate is about 87 percent pure – meaning that it’s about 87 percent creatine and 13 percent water. 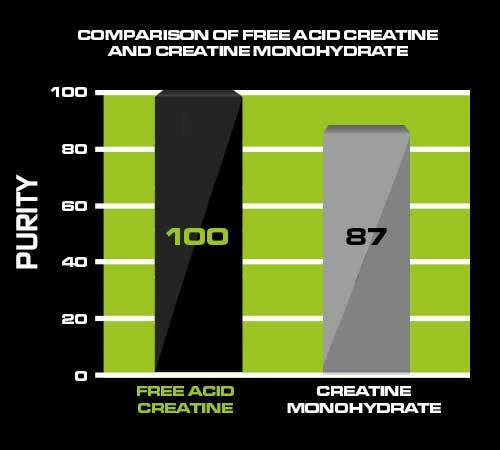 This means that free-acid creatine delivers the most usable creatine on a gram for gram basis, more than creatine HCl, creatine monohydrate, or any other type of creatine available. Creactor features a 1:1 ratio of creatine hydrochloride and free-acid creatine. Each serving of Creactor has 1500 milligrams from the two forms of creatine, and it has twice the amount of creatine of the leading competitor. With Creactor, you’ll have a daily dose of creatine — two servings in a day — and you can easily mix it with your favorite protein shake or BCAA drink. As mentioned before, Creactor is composed of 100 percent pure creatine HCL and free-acid creatine — containing zero carb fillers, carbs, or impurities. To clear up any confusion, creatine “microdosing” or “concentrated dosing” is not effective — there isn’t any research supporting the efficacy of taking low doses of creatine per day. Creactor on the other hand sticks to research. That research was published in the Journal of Applied Physiology — resulting that a dosage of three grams of creatine a day for a month is needed to saturate muscles. This creates an increase in muscular strength, overall performance, and muscle size. 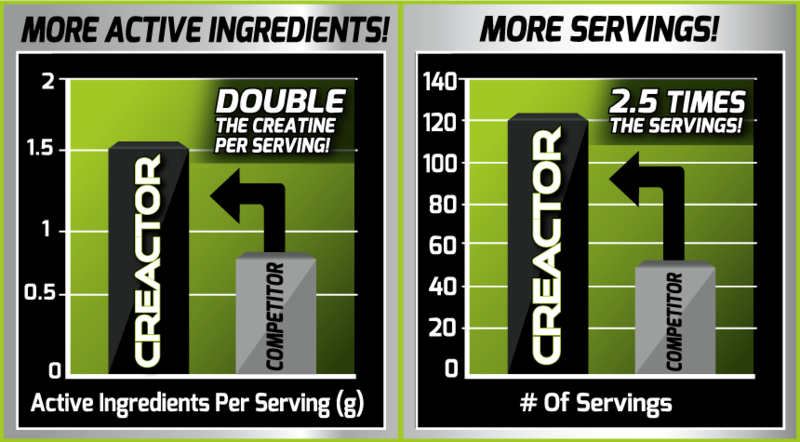 The recommended serving size in Creactor is nearly twice the amount that’s recommend by concentrated creatine brands. As if you need another reason to choose Creactor, remember that some regular creatine products are thrown together with cheap, ineffective ingredients. Creactor is pure HPLC-tested. The quality and purity of all Creactor supplements are tested by a certified U.S., independent, third-party lab, so you can rest assured knowing you’re spending your money on only the best quality product. This article is sponsored by MuscleTech. For more on MuscleTech, visit www.muscletech.com.